It’s mid afternoon, and in a quiet university office an unlikely pair is hard at work. In the background, classical music plays over a stereo – for concentration. Whitney Alves is a coordinator at Riepe College House at the University of Pennsylvania. Each week she spends two hours with Jose, an eighth grader at West Philadelphia’s Henry C. Lea School. Whitney, like many other members of the Penn community, volunteers her time and skills as a mentor for Spark, a nonprofit program aimed at ending the national dropout crisis. Founded by Wharton alumnus Chris Balme (C’ 03, W ’03) Spark connects 7th and 8th graders with working professionals for a hands-on apprenticeship experience. Over the course of 10 weeks, students engage in skills-building exercises, practical lessons, and group sessions on public speaking and building confidence. A parallel in-school curriculum reinforces the link between classrooms and careers, while helping students build the vital skills needed for success in the 21st century. “We’re proud to see alumni, like Spark’s founder Chris Balme, using the skills they developed at Penn to make positive social impact in the world – a great example for our students interested in social entrepreneurship,” says Sandi Hunt, Wharton Social Impact Initiative’s Senior Manager. These exercises give vulnerable and underserved students – now initiated as “apprentices” – a glimpse of the professional world and the many possibilities they can pursue if they fully engage in school. Most of the Spark apprentices come from neighborhoods with excessive high school dropout rates. As a form of early intervention, students like Jose are paired up with mentors like Whitney, to gain experience and grow specific, age-appropriate, employability skills, such as problem solving, time management, and goal setting. In collaboration with Penn’s support for the Henry C. Lea School, university staff and community members have hosted students in each of Spark’s sessions so far, helping establish and grow the program in Philadelphia. For Whitney, who has worked at Penn for roughly a year, the mentoring experience was deeply rewarding. The first weeks, her apprentice was shy. But slowly, she brought him out of his shell. One week, they talked about “creative innovators” like Steve Jobs. Jose says he wants to change the world, to create solutions for the many homeless people he sees on his walks home from school. Inspired by his experience at Penn, Jose said he dreams of one day building a “new kind of shelter” for people experiencing homelessness, like a big hotel. “My dad was in construction, but he died early [in my life],” says Jose. “I wanted to do something like that and thought I’d be a construction engineer.” Now he knows that it’s possible with hard work, persistence, and a good education. 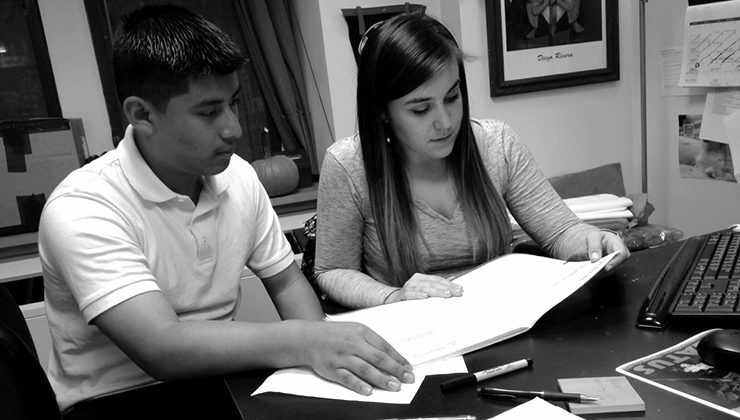 Whitney and Jose spend 10 minutes each week filling out applications for high schools. Whitney has encouraged him to take more challenging math and science courses, to reflect his newfound passion. “This is so awesome,” says Jose, filling out a worksheet on “understanding your needs.” His top choice for school is Science Leadership Academy, which offers the thought-provoking programs that he craves. After working through the stack of papers, Whitney leads Jose through the process of drafting his end-of-semester project, a poster depicting four engineers: a Penn graduate student, a Ph.D., and in the center, a section about himself in the future. To learn more about Spark, get involved, and celebrate the growth and learning of students like Jose, join us for Discovery Night on May 14th, or visit sparkprogram.org.